Floods and landslides caused by heavy rains have killed at least 94 people and left 25 others missing in seven Chinese provinces. Xinhua News Agency said about half a million people had been evacuated in Jiangsu, Anhui, Henan, Hubei, Sichuan and Shaanxi provinces and the city of Chongqing. It said more than 49,000 houses had been destroyed and another 240,000 damaged as a result of torrential rains in the worst-hit Sichuan and Shaanxi provinces over the past week. Overall, total direct economic losses could reach 3.83 billion yuan (US$500 million), Xinhua said. 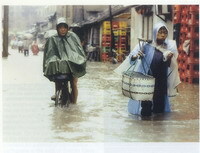 Further rainstorms are forecast for parts of eastern Sichuan in the coming week, the report said. Flooding is a perpetual problem in China, with floods this year killing more than 200 people, destroying 118,500 homes and touching the lives of more than 42 million people, according to the national flood control office. At the same time, droughts in the north of the country have left at least 7.4 million people short of drinking water, Xinhua said.